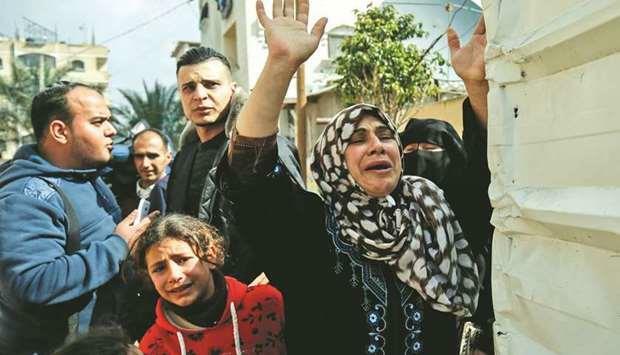 (MENAFN - Gulf Times) Two Palestinians including a Hamas policeman suffocated to death from gas in a cross-border tunnel under Gaza's frontier with Egypt, the enclave's interior ministry said yesterday. Interior ministry spokesman Iyad al-Bozum said 39-year-old major Abdelhamid al-Akar and Sabhy Abu Qarushayn, 28, 'suffocated due to the inhalation of toxic gases. Civil defence crews, alerted on Sunday, retrieved the two bodies from the tunnel 'after a great effort that lasted several hours, Bozum said in a statement. reached for comment yesterday but in 2010 Cairo denied similar charges after the deaths of four Palestinians in a border tunnel. They once served as a lifeline for the cramped territory of 2mn people squeezed between Israel, Egypt and the Mediterranean Sea. But the passages have also been used to bring in weapons by Hamas, the enclave's rulers who have fought three wars with Israel since 2008. Egypt closed or destroyed dozens of tunnels after the overthrow of its Muslim Brotherhood President Mohamed Mursi. Tensions between Egypt and Hamas have eased in recent years and many Egyptian goods are now imported in to Gaza openly through the Rafah border crossing.